Hi Stone Bakers! 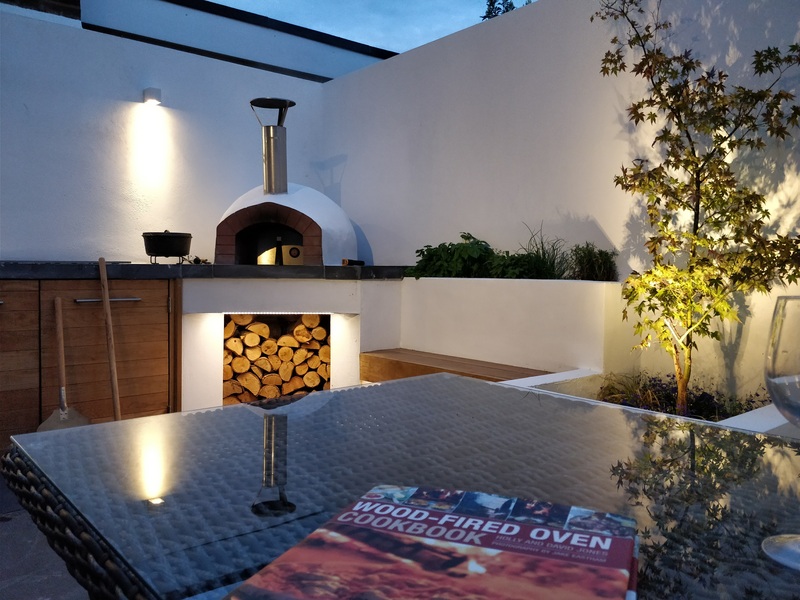 Welcome to November’s oven of the month, our winners this month are Tony and Katy Willis and their Primo 60 kit! Tony and Katy have achieved such an elegant look with their entire garden redesign. 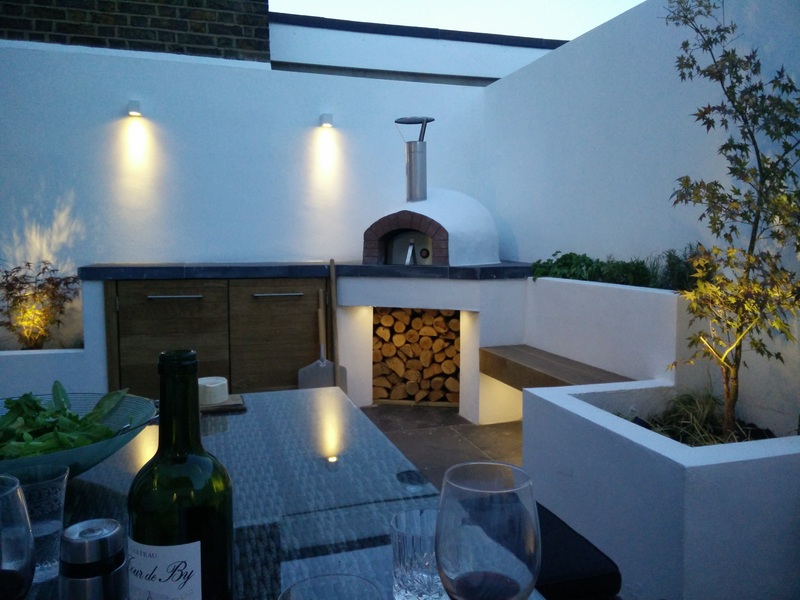 We love the white rendered dome finish of their oven which ties in perfectly with the modern Mediterranean style of their outdoor space. 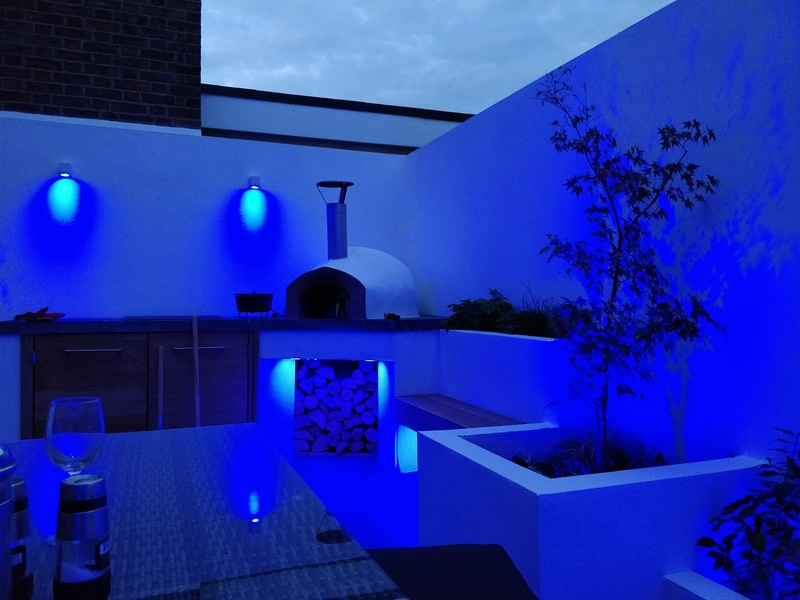 Their colour changing lights also ensure that they are ready for a pizza party whatever time of day! I’ve been making homemade sourdough pizza for about 7 years and these have been gradually getting more refined over the years and have been a feature of my daughters’ birthdays parties and a core part of our weekly family night since then. 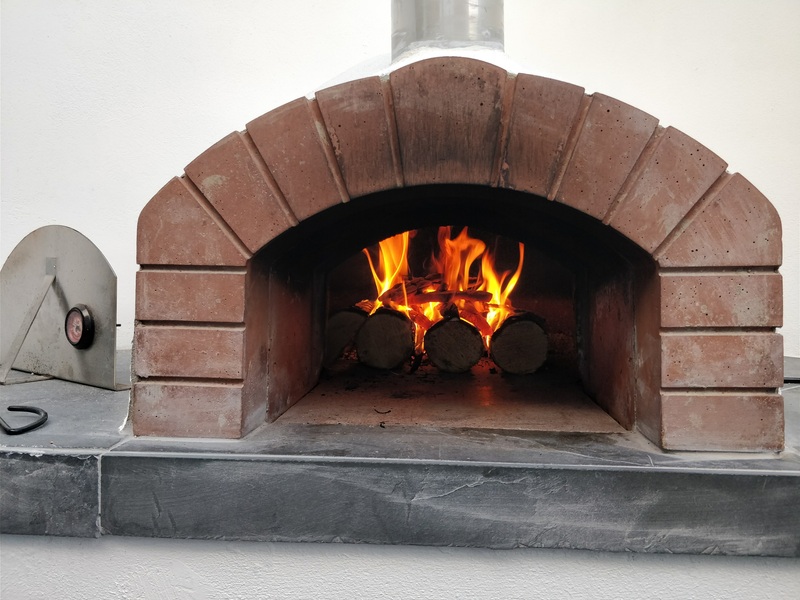 We’d talked about maybe one day getting a wood fired oven after we retire, but when the decking in our courtyard back garden became rotten and needed replacing, we decided that this could be an opportunity to make that dream a reality a bit sooner. 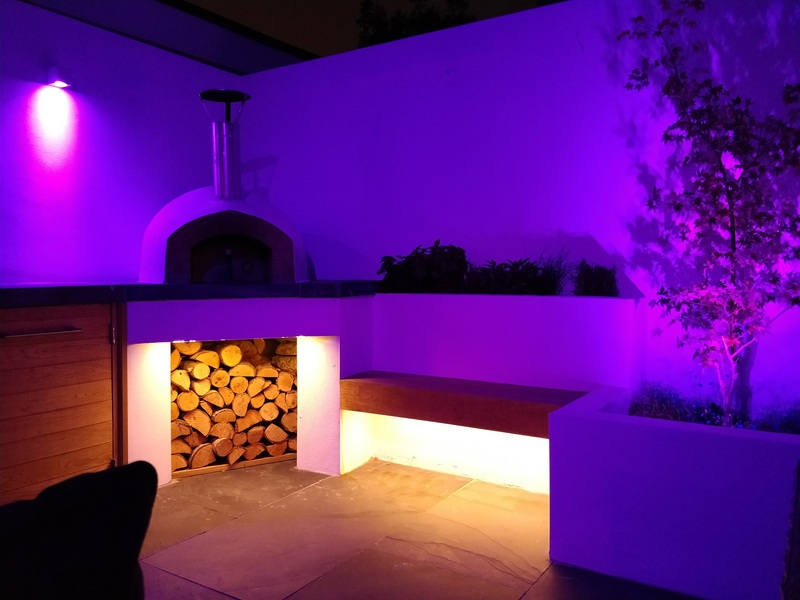 We had some fairly clear design ideas that developed over a few weeks from looking at Pinterest and landscape gardening websites – white walls, raised planters, wooden bench, and adaptable lighting. 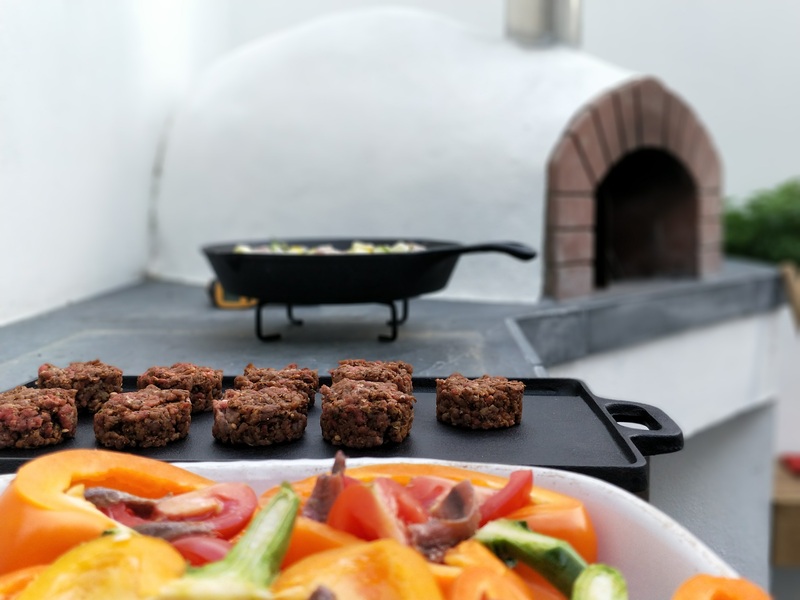 We’ve loved cooking with the oven so far – pizzas, chicken, roast vegetables, merguez burgers, chicken tikka, naans all taste fantastic and retain their juiciness because of the high temperature of cooking while taking on a wonderful smoky aroma. 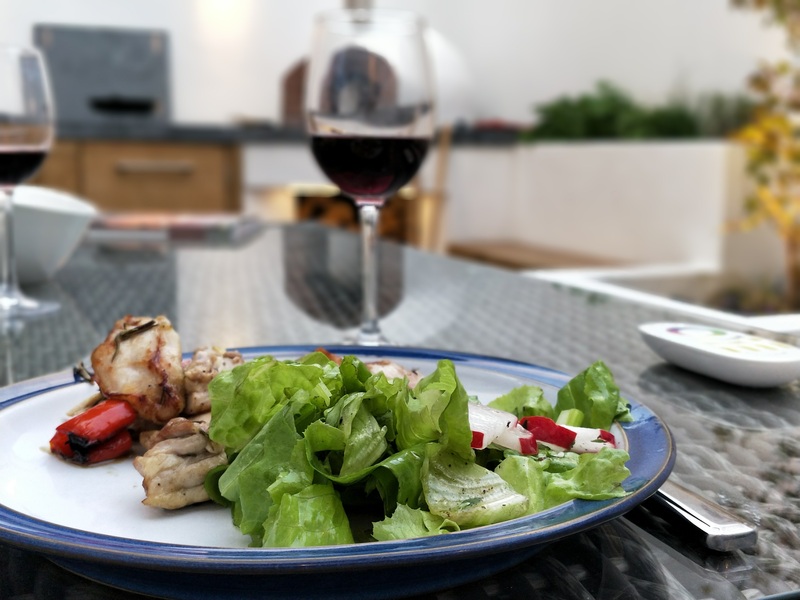 Before the work was done in the garden, we were out there just a few times a year, but since it was completed we’ve eaten outside nearly every day – breakfast, lunch and dinner where possible. The oven makes a great focal point and is producing some fantastic food. For more information on our residential oven range, check out the Primo, Mezzo, Vento and Gusto pages. Please don’t hesitate to contact the team on 01425 204985 should you have any further questions. For all the latest Stone Bake news & updates in the meantime be sure to follow us on Facebook, Twitter, Instagram and Pinterest.